This summer, my wife and I took a trip out to the Olympic National Park in Washington state for five days of camping in some of the most beautiful natural surroundings I have ever seen. To get to those beautiful natural surroundings from my home state of Florida however, you have to fly a really, really long way. Thankfully, our plane was equipped with those little personal in-flight entertainment systems, so I was able to indulge in some binge TV watching, and stumbled upon a little gem of a TV show called Adventure Time. 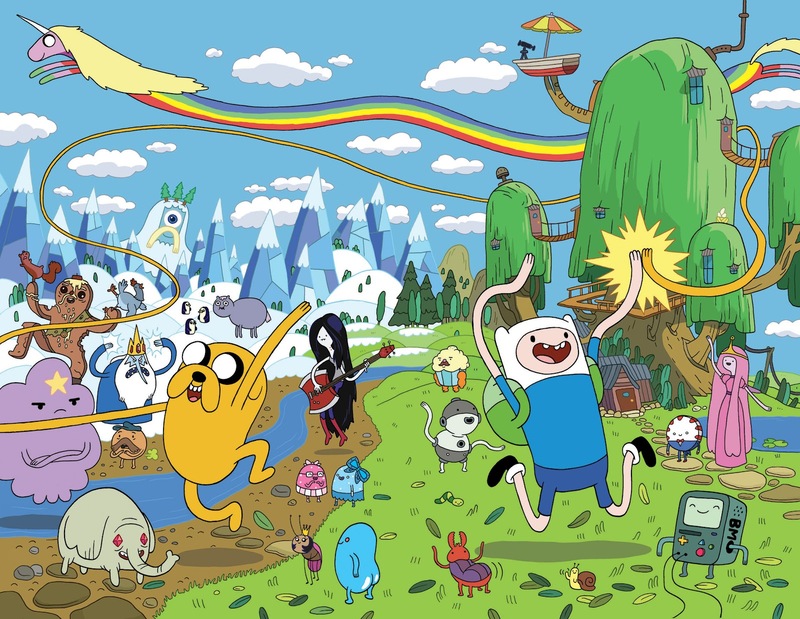 Ostensibly for kids, Adventure Time is one of those shows that is clearly written for adults who are still kids at heart, a camp I thoroughly identify with. Between the colorful frames, the show's characters address the full suite of human emotions, and, as the name might suggest, they have wild adventures while doing it. I ended up watching a half dozen episodes during the plane flight (I only stopped because I watched all the episodes that were available) and have continued to be fascinated with the show since. 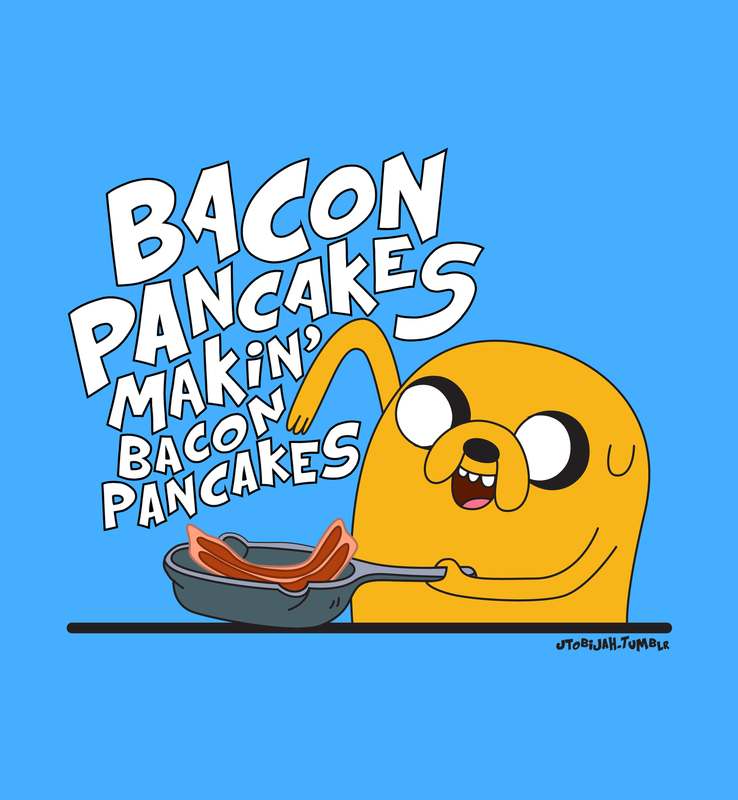 The tune is immediately catchy, especially when remixed with Alicia Keys' song New York, and for days following my first listen, I couldn't get the idea of making bacon pancakes out of my mind. Jake didn't share the details of his own bacon pancake recipe, all I knew is that he made some bacon and put it in a pancake, but I didn't let that deter me and I began to think about the ingredients that would make the BEST possible bacon pancake. There are a lot of bacon this or that recipes out there that use bacon inappropriately in my opinion. This may sound heretical, but simply adding bacon to something doesn't automatically make the recipe better. Bacon is an ingredient that should be treated with respect rather than wanton disregard. 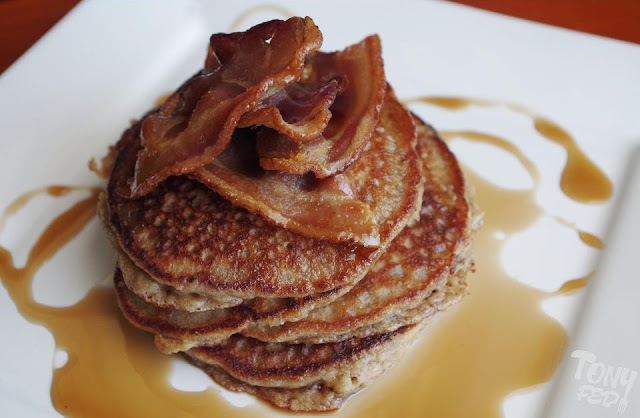 In these bacon pancakes, tender morsels of salty bacon meld perfectly with the sweet flavor of maple sugar and warm cinnamon. In a frying pan, cook the diced bacon just shy of crispy, you want the texture to be tender not tough! Reserve the bacon fat and wipe the pan clean. In a bowl, cream together the coconut oil and maple sugar. Whisk in the eggs, vanilla, and almond milk. In a separate bowl, combine almond flour, plantain flour, cinnamon, and baking powder. Add the wet ingredients to the dry, and mix until thoroughly combined. 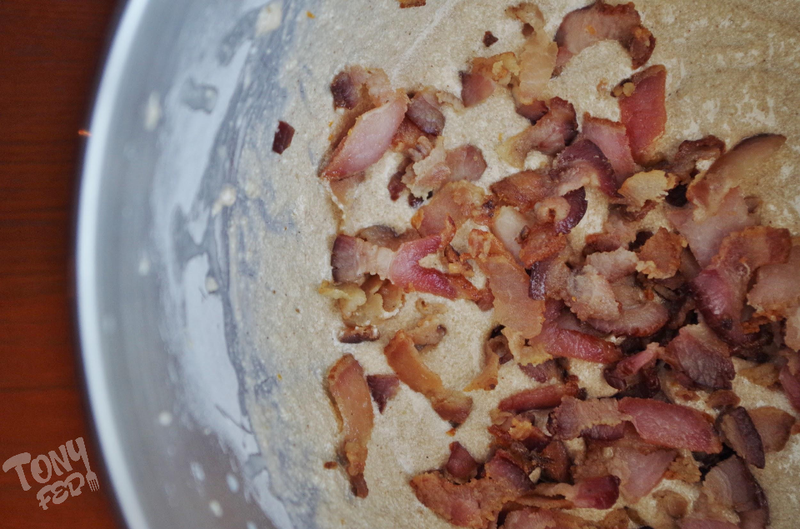 Add the reserved bacon and mix. Heat the frying pan to just below medium. Add a small amount of the reserved bacon fat before ladling in a portion of the batter. The batter will be somewhat loose, so shoot for a pancake that's about 4 inches across (2" diameter). When the bubbles appear in the middle of the pancake, it's time to flip. It might take you a couple failed attempts to get the timing right, but around the third pancake you should have it down. Keep working one pancake at a time, adding a little bacon fat between each pancake, until you have a fat stack ready to be topped with more bacon and a drizzle of maple syrup. It's nice to see a recipe that utilizes plantain flour. The paleo mom's plantain pancakes is kind of my go-to recipe. But not having to process the plantains every time would be much easier. Thanks for the recipe.